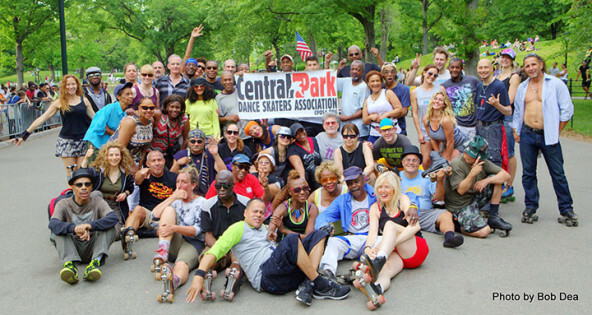 On the Fourth of July this year, the Central Park Dance Skaters celebrated its 20th anniversary of hosting the Skate Circle in Central Park. In 1995, the newly elected Guiliani administration enacted a ban on amplified sound in public without a police permit. At the same time, the number of people allowed to congregate without a special events permit was cut from fifty to fifteen. One beautiful warm Saturday morning in mid April, a task force of police and parks enforcement vehicles swarmed into the Dead Road. A police Sergeant told the skaters assembled there that they couldn’t play music. Carlos Benitez, in the belief that we were living in a democracy, said: “They can’t do that, this is America.” He turned on his radio and it was confiscated. Enter your email address and CLICK THE SUBMIT BUTTON to receive information about our events and other roller skating events in the New York area. Once you signed up, look for an email from us within a few minutes so you can confirm your subscription.